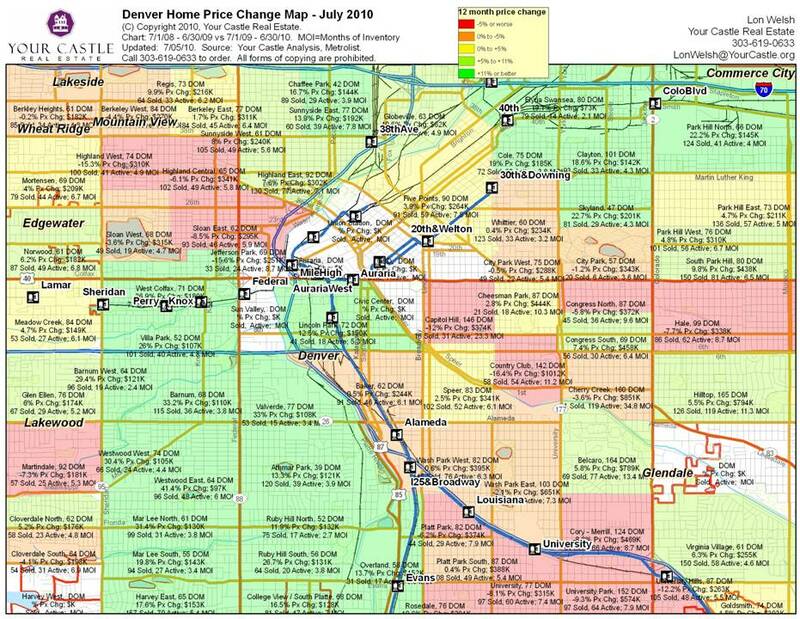 You are here: Home / Denver Real Estate News / What Will Happen To Home Prices In Your Neighborhood? 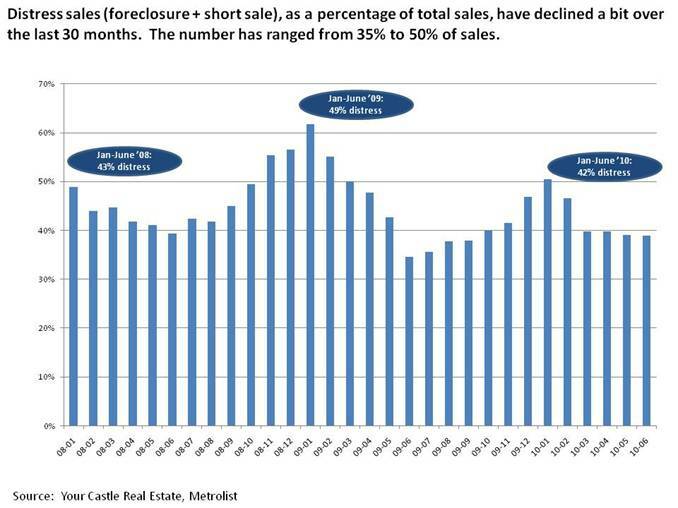 The growth in short sales has almost perfectly matched the decline in foreclsoure activity so the number of distress property sales has remained relatively constant for the last few years. 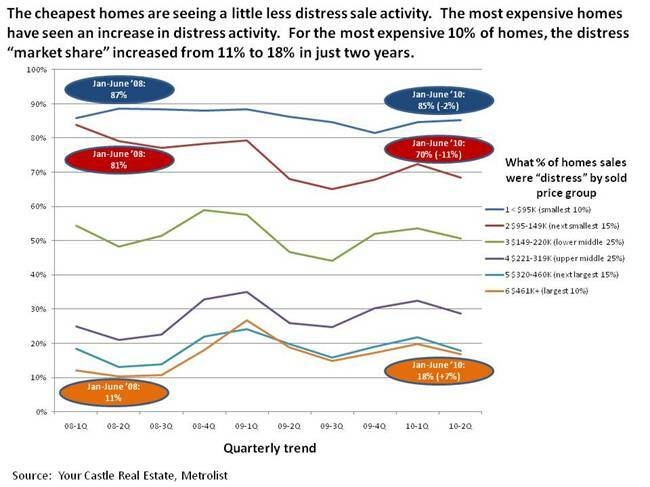 Interestingly, the price of the property has a big influence on the amount of distress sale activity. The cheapest 10% of the homes in the Denver market sold for under $95K. The amount of distress activity has declined slightly, from 87% of sales to 85%. There are very few “regular” sellers at this price point. One size up from this group are the homes from $95-149K. Distress activity for these homes has declined from 81% to 70%. At the other end of the scale, the most expensive 10% of Denver homes are those over $461K. Distress activity here has increased from 11% to 18% of total sales. On the high end, “normal” sales (e.g., not distress) are still the norm… although this is gradually changing. The average sales price of a S/S is below the average sales price for “normal” sales. While it’s fun to speculate what will happen next to the real estate “market”, for most buyers and sellers, it just doesn’t matter. What matters for your unique situation is what is going to happen in your neighborhood. The old adage of location, location, location has never been more true than it is today. If you want to get a sense of where your neighborhood’s price might go next, there are two variables you might consider – distress sale “market share” (and how that is changing) and months of inventory. Denver Neighborhoods Map. Double click on this map to expand and read it better. The areas in green are the 20% of the neighborhoods where distress “market share” has declined the most. We would expect some upward trend to prices in these areas, all things being equal. The areas in red are the 20% of neighborhoods with the most increase in distress sale “market share”. We’d expect to see prices under some pressure in these areas, as more distress properties sell at the expense of regular sellers. The second factor that might influence home prices in your immediate area is months of inventory. MOI is calculated by taking the number of homes that sold in last twelve months, and dividing it into the number of active homes on the market. If the buyers keep buying at the pace they have been purchasing, how many months would it take to sell all of the homes on the market? Six months is a normal, balanced market. Less than four months is a strong sellers market – there are too many buyer chasing not enough listing inventory. Prices might increase. On the other hand, more than eight months of inventory is a strong buyers market. There are too many homes on the market for sale and not many buyers. Prices might decline. Let’s look at Platt Park, which is at the junction of I-70 and Santa Fe. In the chart above, we can see that there were 44 homes sold in the last year and there are 29 homes on the market. The MOI is 7.9, which is a buyer’s market. Not surprisingly, the average sold price ($374K) dropped 6% in the last twelve months. If you look at the distress chart above that for Platt Park, you’ll see 16% of the sales were distress in the last twelve months, which is a 9% increase. That is a big jump. We’d expect some downward pressure on home prices here. On the other hand, take a look at Ruby Hill South, which is almost directly to the west of Platt Park. In the map just above, you can see that 64 homes sold in this area in the last twelve months, and there are only 20 homes on the market. MOI is 3.8. This is a strong sellers market. The average home price is up 27% in the last year. Why is that? If you look in the map above that, you can see that the distress sale “market share” is 54%… a 20% decline in the last year. Here’s a guess of what might have happened: 18 months ago, almost all of the sales were distress sales. Investors probably bought a number of the properties in poor condition at discount prices. They rehabbed the properties and more recently sold them in their fixed-up condition. This might partially explain why the distress market share is declining and the abrupt increase in average price. DOM is Days on Market – it’s the average marketing time to get a new listing under contract. If you look in Platt Park, you can see it is 82 days (which is still a good performance). In Ruby Hill South its 56. Where there is more buyer demand, the homes tend to sell faster. Talk to your Realtor and have them get the stats and trends for your neighborhood. If you have been thinking of selling, it will help you gauge if prices are likely to increase (if so, you might wait until spring to list) or decline (in which case you might want to list ASAP). 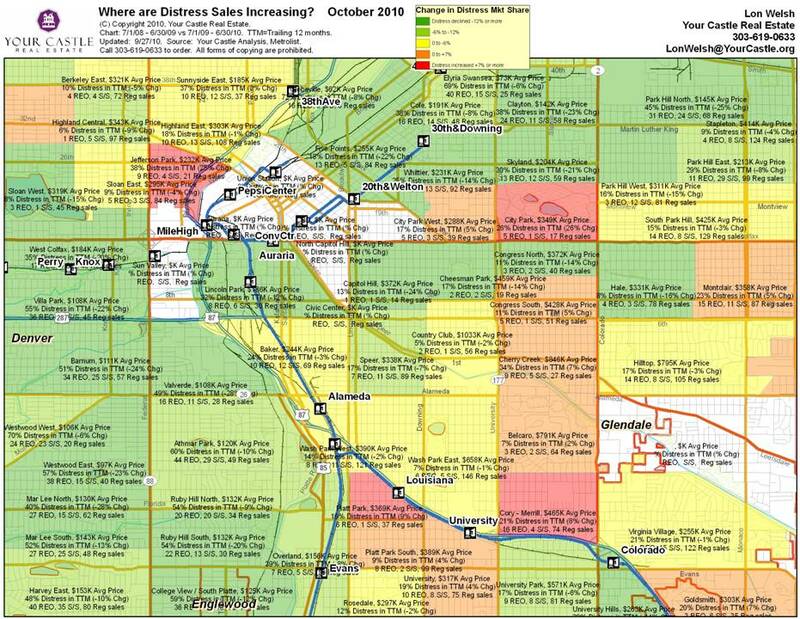 I like your local housing report for Denver, CO, and it’s interesting to see what percentage of sales in your area the last year were distressed sales and whether increasing or declining. 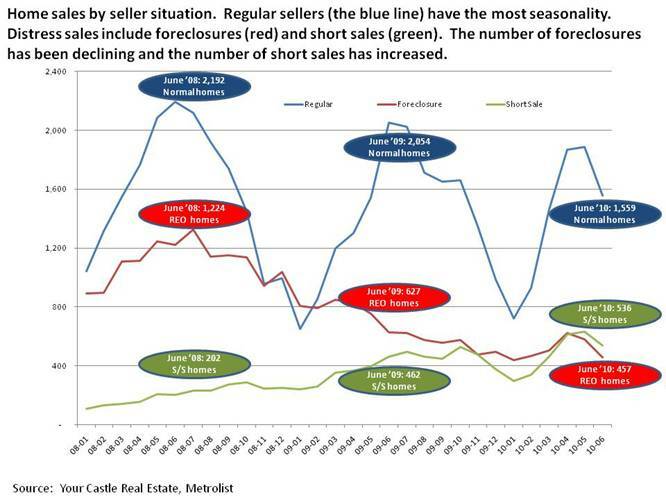 You said: “Since distress sales (often in rough condition) usually sell for less than “regular” sales (often in move-in ready condition), an increase in distress “market share” often points to a future decline in value.” Not sure I agree with that conclusion and will check the premise out at our Irvine and South Orange County, CA, neighborhoods. Harrison K. Long, REALTOR and broker associate, Coldwell Banker Residential Brokerage, Irvine, CA. Great information. I am from a different market but just ran across your blog and wanted to say that it is very impressive.